Yes, this absurd and insulting re-enactment actually happened. 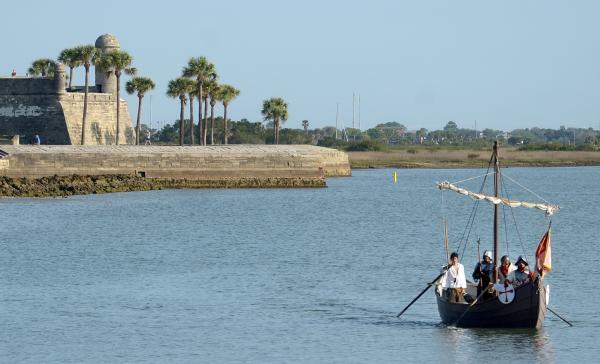 This week marked one of the largest events of Florida’s “Viva 500” celebrations, a symbolic landing of Ponce de Leon in St. Augustine. Despite being a despicable individual to honor, no records even indicate that Ponce ever stopped there. Thankfully protestors where there to disrupt the program. 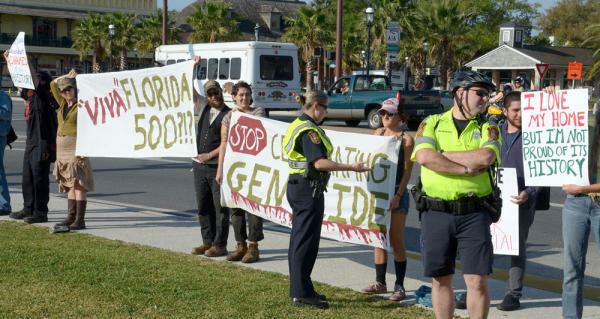 The protest was organized primarily by participants in the Trans and Womyn’s Action Camp (TWAC) occurring in southwest Florida this week. A blood-splattered Ponce painting from Lake Worth. Read the sad over-paid artist’s whining here. Activists across the state, including Earth First! folks and other indigenous allies, have been following the Viva 500 schedule and intervening where the opportunities arise. For example, splattering fake blood on a painting of Ponce last month during Lake Worth’s Street Painting Festival. “This is a historic time and I’m thrilled to witness this celebration. It’s too bad the king and queen of Spain aren’t here, but I hope they’ll come for the 450th commemoration in two years.” That was Brenda Romano of St. Augustine Beach, who also told the St. Augustine Record that she’d been looking forward to this since Jan. 1…. Just in case you weren’t already embarrassed enough by the idiots who you co-habitate this stolen land with. Ponce’s original journey from Puerto Rico led him west-northwest to what he thought was an island. He arrived on April 2, 1513, supposedly at 30 degrees, 8 minutes north latitude, which he named La Florida. The following day he became who some historians believe to be the first European to step on the soil of the New World. Anti-Viva 500 protests, St. Augustine, April 3 2013. On Wednesday, Ponce was portrayed by St. Augustine actor Chad Light, who stepped from the launch, planted the Spanish flag into the bayfront grass and read a proclamation claiming these lands for King Ferdinand. 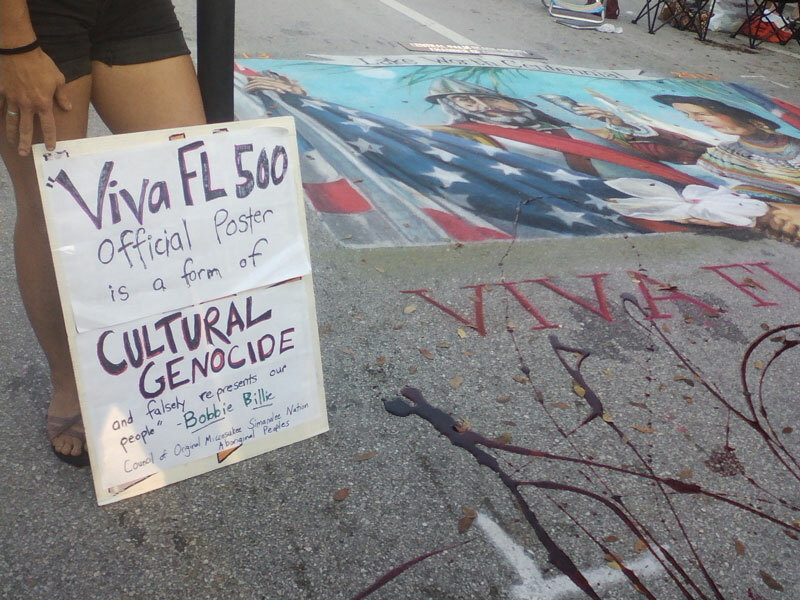 One spokesperson of the protest was quoted pointing out that diseases, overwork and “genocide” by Florida’s Spanish conquerors stole the lives, labor, language, history and culture of the native peoples. 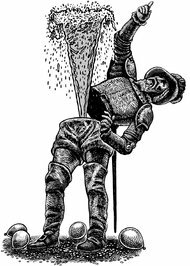 Another, who was dressed as Ponce with a silver chalice handcuffed to his wrist, was forced to his knees by one of the women in the group. Deputy secretary of state, Kerri Post, also spoke, saying that 350 events about Ponce de Leon are being held around Florida. Post claimed to be working “very closely with the Seminole tribes of Florida.” But several years of persistent opposition to the Ponce de Leon celebrations from traditional Seminoles and indigenous solidarity activists tells a different story. The United Urban Warrior Society of Florida released a statement earlier this year regarding their participation in challenging 450th Commemoration events saying the are “dismayed that during such a enlightened period of history when Florida, the United States and much of the globe struggles with a failing economy, that the City of Saint Augustine would even consider spending thousands of dollars commemorating,not the founding of their city but the involvement of Pedro Menendez and Juan Ponce de Leon in the history of St. Augustine and Florida. But the commemoration will not be just one day; it is extending over a four year period which started in 2012 with the bicentennial of the Spanish Constitution and is continuing into 2013 with the 500th anniversary of the founding of Florida by Juan Ponce de Leon, culminating with St. Augustine’s anniversary in 2015. The City’s most recent draft of the 450th Commemoration Strategic Master Plan can be viewed here. Hi Panagioti, The whole French Protestant Catholic Spanish calamity has recently been well published with TD Allman’s Finding Florida. The first three chapters almost rewrite the Conquistador attempt. St. Augustine’s true story is for an epic movie. Miami was the first Native American settlement discovered,the Tequesta took for the woods and warned the Calusa on the other side, They were the first people to check the advance of the Conquistador expansion. It is them we ought to be honoring. The Florida State Library has been exhibiting De Fry etchings. he was responsible for illustrating Bart de Casas’s eye wittness account of the Cuban genocide in 1512/3. Together they horrified Europe of the Spanish Caribean histories, that is why we have ridiculed Ponce and the fountain for so many decades. In 1994 the Columbus 500 got similar treatment , a whole host of publishers released de Casa’s writings. The Native south Florida Americans defeated the Spanish many times, We honor them not the slavers.